Facilities: FCI Greenville with an adjacent minimum security satellite prison camp. 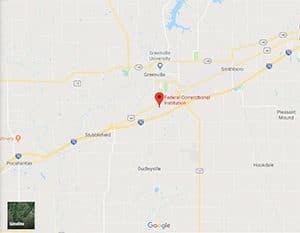 Location: FCI Greenville is approximately 43 miles east of St. Louis, Missouri and 63 miles from Springfield, Illinois. Background: FCI Greenville opened in 1994. Inmates in the satellite camp provide support services for FCI Greenville. Notable inmates include former LAPD officer David Mack (released in 2010 after serving 12 years for armed robbery), Animal Liberation Front member Walter Bond (serving a 12-year sentence for arson), and Derrick Shareef (serving a 35-year sentence for attempted use of weapons of mass destruction). Housing: Inmates are housed in one-person, two-person, and three-person cells within the four housing units. Inmates in the camp are housed in dormitories of two-person cubicles. Health Services: FCI Greenville’s Health Services Unit provides medical, dental care, and support services to all inmates. These services include sick call, dental call, emergency medical treatment, medications, eye care, and preventive treatment. Psychology Services: Inmates at FCI Greenville and the camp receive initial screening, assessment, and treatment of mental health and drug abuse problems, individual and group counseling, psycho-educational classes, self-help supportive services, crisis intervention, and referral to Health Services for medical treatment of a mental illness. The camp offers the Resolve Program, which is a non-residential program for female inmates who have a history of physical and/or sexual abuse, and a Trauma in Life Workshop, which addresses the challenges individuals face following exposure to traumatic life events and the strategies these individuals may use to enhance their resilience or ability to survive and thrive following these events. Residential Drug Abuse Program (RDAP): FCI Greenville does not house a Residential Drug Abuse Program (RDAP), however it does house a Drug Abuse Education Program. The satellite camp offers RDAP as well as a drug abuse education course and the Non-Residential Drug Abuse Treatment Program (NR-DAP). Education Services: FCI Greenville provides GED and English-as-a-Second Language (ESL) programs. Adult Continuing Education (ACE), parenting, release preparation, and offender placement programs are also available. High school diplomas and post-secondary programs are available at both institutions through paid correspondence programs. Advanced Occupational Education: FCI Greenville offers advanced occupational education in Microsoft Office. The camp offers advanced occupational education in Horticulture, Microsoft Office, and Sewing. Vocational Training: FCI Greenville and the camp offer vocational training in Cabinet Making 1 & 2. Apprenticeship: FCI Greenville offers apprenticeships in Electrician, Landscape Management, Machinist Wood, Sewing, Teacher’s Aide, HVAC, and Quality & Assurance. The camp offers Animal Trainer, HVAC, Landscape Management, Teacher’s Aide, Welding, and Prisoners Assisting with Support Personal Care and Service Dogs (PAWS). Library Services: The education library is designed to support leisure reading, independent study, and academic programs. Resources include a variety of printed materials in various forms, as well as audiotapes, videotapes, and reference materials. An active interlibrary loan program is available to supplement the inventory of available reading materials. The law library also provides access to legal research materials. UNICOR: The FCI Greenville UNICOR facility produces clothing and textiles. Commissary: Inmates at FCI Greenville and the camp are permitted to spend up to $360.00 per month for commissary purchases. Items that do not count against an inmate’s monthly spending limitation include phone credits, postage stamps, and over-the-counter medications. Inmates are only allowed to shop once a week on their designated shopping day. Recreation Services: Programs at both facilities include indoor and outdoor activities and range from individualized arts and crafts programs to intramural team sports such as softball, basketball, volleyball, and more. Physical fitness, weight reduction, and hobbycraft leisure activities are available (e.g., art, yarn and crochet, beads, music, foosball, a variety of card and board games, chess, checkers, dominoes, scrabble, etc.). FCI Greenville also offers structured leagues in basketball, softball, soccer, volleyball, handball, horseshoes, racquetball, ping pong, badminton, and paddle ball. A wellness room provides treadmills, bikes, a row machine, and other equipment, as well as yoga classes, aerobics class, afternoon calisthenic and nutrition classes, and structured walking and jogging programs. The main facility also has a photo program, movies shown weekly via television in all housing units, and a Music Program with a variety of leisure bands.